I f you're into the no fuss raw-garage /psychedelic side of the American sixties in the spirit of Syd Barrett and Rocky Erickson you'll be overblown by this gem. 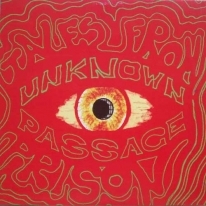 “Tales From Prison” is their first release consisting of 7 tracks and including a magical rework of Lucifer Sam (Pink Floyd) and White Rabbit (Great Society / Jefferson Airplane) blended into a single track. Expect to be blown away by this prodigiously talented band! Last 20 copies!! !